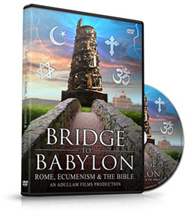 Follow the story of the Bibles controversial history into the twentieth century, as the work of Westcott and Hort would transform biblical scholarship, inspire the work of various Bible Societies, and pave the way for the cause of ecumenical unity between Evangelical Protestants and Rome. For the Christian there is no choice to be made between gospel and culture, and no antithesis between culture and the Christian faith. Van der Waal does not promote a false sense of optimism, but does oppose cultural pessimism. The believer is the rightful heir to this inheritance. The cultural mandate has as much a place in the New Testament era as does the mission mandate. On that basis, he calls us to cultural engagement and to living life on this created earth as whole human beings with bodies as well as spirits and souls. We are not to transform culture, and certainly not to counter it, but simply to fulfill our calling. Christians are called to be salt and light, not only through pure doctrine and preaching to save souls, but by showing how life is meant to be lived on this created earth. As part of our mission mandate, we need to be able to have meaningful dialogue between Jerusalem and Athens. That dialogue should point back to creation and the new creation (Easter), and forward to the resurrection of our bodies. Rev. 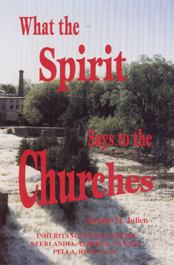 Jerome Julien in The Outlook: This is a wonderful addition to a home, church, school, or minister's library . . . Originally, these notes were commissioned by the Great Synod of Dort, 1618-1619, along with the Staten Bijbel, a completely new translation of Scripture. In a very real sense, this is probably the earliest study Bible ever produced. We might say of it that it is a short commentary on the Bible. This volume, the first of what is planned, D.V., to be a republication of the whole set of annotations, contains an historical sketch  written most likely by Theodore Haak, and other documents from the 1637 Dutch edition. There is also an account of a gold coin produced by the States General of the United Netherlands commemorating the Synod. This coin is also stamped in gold on the front and back covers. (It must be added that the binding is beautiful!) Inside the front and back covers are reprinted the title pages of the Dutch Staten Bijbel and the English translation by Haak, dated 1657. 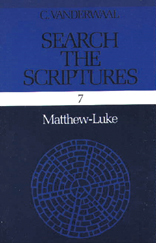 The notes are preceded by an introduction to each Bible book, and a summary at the head of each chapter. While the notes on Genesis are much more detailed due to the nature of the content, many insights are found on all the pages. These notes might not be what you would read in a commentary published today, but they give concise explanations of the verses. 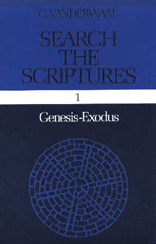 Regularly, they give cross references to other Biblical passages which shed further light on what God says in the text. Also, these notes give a historic-redemptive understanding of the Bible history. Ministers, as well as Bible students, will find helpful information here, as well as ideas to develop. For those who might be interested, the position on creation days is "that night and day . . . made up one natural day together . . . comprehending twenty-four hours" (see Genesis 1:5). Further, the Book of Genesis lays open God's "everlasting covenant." The note on Genesis 17:7 states that it is "Everlasting for all believers in Christ . . ." This subject is discussed at great length in the appropriate places. Of what value is this new, but very old set of notes? Some scholars might look with disdain on a republication of these notes. Yet, historically they have value because we can read in English what our fathers at Dort taught and believed concerning Biblical teachings other than those well explained in the Canons of Dort. It is foolhardy to cut ourselves off from our heritage, as so many wish to do today. 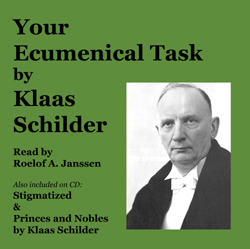 Now, what has been readily available in the Dutch language for the last 350 years, is in a newly translated and typeset English edition for our reading and spiritual benefit. Further, this volume has a practical value. For those who still attend church society meetings, or for those involved in Bible studies, here is a concise and helpful Reformed commentary. Its format allows it to be on the table with our Bibles, Psalters, and notes. This is an ambitious project which Inheritance has undertaken. We must be grateful for their dedicated work. It is the hope of this reviewer that the day will come, beginning now, when this set will not only be displayed in many, many homes, but also well worn through use. In this day of seemingly shrinking interest in the Reformed Faith we and our children must be grounded in God's Truth! In a time of much confusion and debate about reliable manuscripts of God's Word, as well as the proper place of God's Church, Covenant, and the Christ-centeredness of the whole Bible, there is an urgent need to reach back to one of the best and possibly only ecclesiastical translation of the Bible ever made. Even though the States General of the United Netherlands authorized this translation, it did so upon a decree of the famous Synod of Dort (1618-1619). The high value of this translation and its annotations  also written by the translators, who were among the best theologians of the early seventeenth century  is evident in the example below. The translators were not bothered by publishers who wanted to have as big a market as possible and so make compromises to avoid controversies as is the case so much today but seriously looked at what God revealed in His Word and stuck faithfully to the text. Their humbleness in often not being sure of what the text really means is evident throughout the annotations, nevertheless they have given a faithful translation of these texts. There is no better tool for the unity of God's church today then abiding by a reliable Bible translation and explanation. 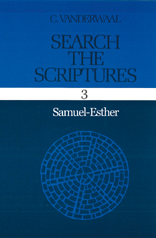 Since this English translation is not a direct translation of the original texts, it would not be suitable as a current ecclesiastical translation, but nevertheless it may be one of the best tools to come to a new ecclesiastical translation. In the meantime it is a number one tool for personal and group Bible study for those who cannot read the original languages. Roelof A. Janssen, editor and publisher. The last words of David, in which he testifies of his calling from God to the royal and prophetical office, v. 1. He prophesies of the Messiah Jesus Christ, and the blessed salvation under His reign, with the acknowledgment of the faults of his house, and a confession of his confidence in God's everlasting covenant of grace, v. 3. 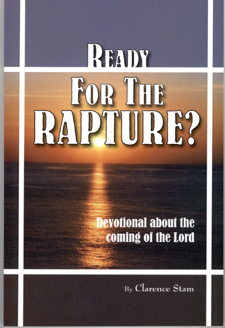 He announces everlasting destruction to the ungodly, v. 6. A history of David's heroes and their courage, v. 8. 1 Before his death, according to the example of Jacob in Gen. 49, and of Moses in Deut. 32 & 33. 2 Lifted up from low conditions and anointed as king over the people of God. 3 Which he wrote for the church of God by the inspiration of the Holy Spirit. 2. "The Spirit of the Lord has spoken through me, and His word has been upon my tongue. 4 As also in 2 Sam. 22:2. Compare 1 Cor. 10:4. 5 Or, of me; meaning that David here relates the prophecies which God had given him concerning himself, his kingdom, and his house, partly to David himself, partly to the prophets, Samuel, Nathan, etc. 6 See Is. 53:11; Jer. 23:5, 6; 33:15, 16; Zech. 9:9 and its annotations. 7 Compare Is. 11:2, 3. Understand by this Ruler our eternal spiritual King and Lord Jesus Christ, whose type David (as also Solomon) was, and of whom God had revealed to him that He should proceed from his seed, (according to the flesh). See Ps. 2:8; 72:8; Jer. 30:21; Micah 5:2. Others understand it as a description of the virtues and duties of rulers or governors, applying to it also the following comparison in 2 Sam. 23:4, as by this the graciousness and usefulness of such rulers as David and Solomon is meant, though lacking in much. 8 That is, the coming of the Messiah and the carrying out of His soul-saving office will be so pleasant, acceptable, profitable, and fruitful for His church, as the things mentioned in this comparison are for the earth and its harvest. Compare with this verse Hosea 6:3; Ps. 110:3. Compare also Is. 60:1, 2; Mal. 4:2; Luke 1:78. And compare Is. 44:3, 4ff; 55:10, 11; etc. 9 David confesses here his sin and unworthiness and also those of his house (compare 2 Sam. 7:18, 19, etc. and see also 2 Sam. 11-13, & 15, etc.) and on the contrary praises God's undeserved bounty, shown to him in the everlasting and unchangeable covenant of grace, being founded in the Messiah, whose day David (as also Abraham) saw by faith, by which he was comforted, falling joyfully asleep in the Lord. Compare 2 Sam. 22:51; Ps. 72:20 and its annotations. 10 That is, which in God's everlasting counsel, for His own glory and the salvation of His people, with all the means belonging to it, is wisely decided and previously ordained and shall be so firmly kept and preserved to the final fulfilling thereof, that the gates of hell shall not be able to prevail anything against it. Compare Matt. 16:18; Acts 13:23, 32, 33ff; Eph. 1:3, 4ff; 1 Peter 1:5, 10, 11ff. 11 Although the promised shoot or stem of Jesse and David, the Mediator of the covenant, the Messiah, has not yet come. Compare Is. 4:2, 11:1; Jer. 23:5; 33:15; Zech. 3:8; 6:12. Some believe that in the verses 4 and 5 David places opposite one another the temporariness of things, related in verse 4, and the everlastingness of his kingdom and house in the Messiah, who would spring forth from his seed; they translate these two verses thus: 4. "And as a light of the morning, when the sun rises; the morning being without clouds, by the glaring, by the rain, the tender grasses springing out of the earth; 5. "That my house will not be thus with God, for He has made me an everlasting covenant, in all things well prepared and kept. Certainly all my salvation and delight is that He will not cause it to spring forth (as that which now already has sprouted forth, and shall in eternity not perish). 6. "But the men of Belial,12 they shall be all as thorns that are cast away because they cannot be taken hold of with the hand. 12 That is, reprobates, ungodly ones, wretches, despisers and enemies of the kingdom of Christ. Of this word, see the annotation to Deut. 13:13. 13 Heb. is filled with, etc. ; that is, he fills his hand, he furnishes himself first with some instruments with which he may handle the thorns without hurting himself. 14 Heb. burning will burn. 15 In the place where they grow or were cast, where they lie. Heb. actually in the seating place or place of abode or chair. 16 Thus David's chief officers are called here because of their outstanding courage, bravery, and fearlessness in the war. The order appointed by David among them according to their courage and deserving is very remarkable. See 1 Chron. 11:11ff. In its eighth session, the Synod of Dort has established the rules with which the Annotations had to comply. If a Hebrew or Greek expression had to be translated in a somewhat freer way because of the different Dutch idiom, then the more literal translation had to be taken up in the Annotations. Further, some short explanations could be given, but without presenting thereby the development of any point of doctrine. Finally, similar texts must be noted. . . . For the explanation the translators made use of the best available to them, in particular the commentaries of Calvin and Beza . . . [while the "learned and experienced theologians" also added their own, J.G.]. One can say that the annotations on the State translation present a precious piece of work and have been of great importance for our people. These last words appear true, since even in 1980 and again in 1997 new editions of the Dutch State translation with their Annotations were published (see p. 7). Their importance is also evident in the fact that in 1648 the Westminster Assembly in England decided that it was good to have these Annotations translated into the English language for the English people. When the publisher of Inheritance publications, br. Roelof Janssen, planned to publish these "Annotations" in the English language, he was told about this existing English translation of about 1650. 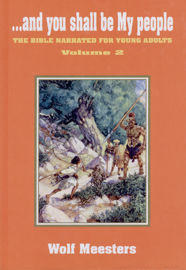 He found it and used it for this revised 2003 English edition (p.7-8). Now it is true that today there are many, more or less extensive, commentaries on the market. Yet, these "Annotations" hold their value. For they present a Reformed interpretation of the Scriptures, going back to Calvin, Beza, and other Reformed Scholars from 1619 till 1637. One of the strengths of these Annotations is their reading of Old and New Testament as a unity: as the one Word of God that in both Testaments gives us testimony about Christ Jesus. At Gen. 3:15 the following note is added at the word "Seed" (with a capital letter): "This Seed is actually the Lord Jesus Christ, the only begotten Son of God, who was to be born in the fulness of time, of a woman, a virgin, by the working of God's Spirit, in order to dispossess the devil of all his brute force, through the merit of His death and the power of His Spirit, and to tread him under His and His Church's feet. See Ps. 110:1; John 12:31; Rom. 16:20; Hebrews 2:14;1 John 3:8. This is the first Gospel promise of life, put in opposition to the first denunciation of death. See also Col. 2:15." And the note with the words that Satan will "crush His heel" reads, "That is, the devil and his seed shall persecute Christ and His Church, but never be able to eliminate or destroy them." These Annotations belong to the books I personally consult; and I know colleagues who do the same. I thank the publisher, and congratulate ourselves and our global English speaking brotherhood with this second, revised, publication of the Annotations in the English language, now in a modern format. I sure wish and hope that this book too will find many buyers, and that this first volume with Genesis and Exodus will be followed by all the other books of the Bible. Rev. G.R. Procee in The Messenger about Vol. 1: For many generations our fathers in The Netherlands treasured a beautiful Bible commentary that was present in nearly every home. This commentary consisted of marginal notes that were printed with the text of the Dutch States Bible of 1637 (Staten Bijbel met Kanttekeningen). These marginal notes have been widely used in the Dutch churches for centuries with much edification. 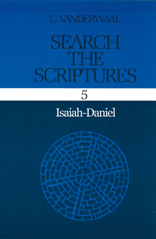 They are still in print today and are considered to be a very reliable Reformed explanation of God's Word. Those of us who know the Dutch and are somewhat familiar with these marginal notes will readily agree that the quality of these annotations is excellent. These notes supply comments on various aspects of a particular text and do this in a brief, concise, clear and factual manner. It is amazing how succinct and pointed these notes are. Without any unnecessary details one will find a direct answer to many questions concerning a particular Bible text. 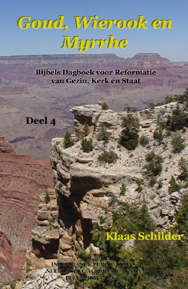 Office bearers, and especially ministers who are called to prepare a Bible study and who have little time to consult extensive commentaries, will find a gold mine in these Dutch annotations to the Bible. The origin of these Dutch annotations can be traced back to the great Synod of Dort, 1618-1619. 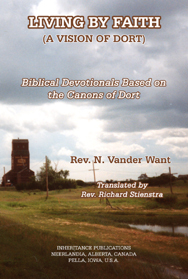 We all know that at this international synod of Reformed churches the Canons of Dort against the Arminians were formulated. But the Synod of Dort also made other important decisions. One of these was to supply the need for a thorough Bible translation in the Dutch language. Until this time, the Dutch churches had to use translations from German or English into the Dutch language. But in 1618 the Synod addressed the urgent need to have a clear translation of the Holy Scriptures into the Dutch language taken from the original Hebrew and Greek texts. In the 8th session of the meeting it was decided to assign the work of Bible translation to some specifically Reformed theologians and also to give them the task to compile marginal notes. These notes, placed in the margin besides the Bible text, give another possible translation of a word and explain difficult expressions found in the text. To facilitate them in this work, these theologians made extensive use of commentaries by Beza, Calvin, and other Reformed theologians. The notes had to be short and pertinent to the Bible text. The synod did not want the annotations to contain doctrinal expositions, but they were simply to be concise explanations of the actual Bible text. Therefore, the annotations are very succinct and to the point. They portray a Reformed understanding of Scripture, implying the unity between the Old and New Testaments, and rendering the centrality of Christ in both Testaments. 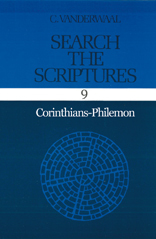 The annotations demonstrate a Reformed hermeneutical approach to Scripture, such as allowing the difficult texts to be explained by the more simple texts, and supplying many textual comparisons. The result was a very scholarly Reformed Bible with annotations. The Dutch government stimulated and financed the complete project and insisted therefore that the official name would be the "Dutch States Translation Bible." It was recognized in the international Reformed community as an outstanding work, evidenced by the fact that the Westminster Assembly in 1648 decided to translate these Dutch annotations into the English language. They solicited the help of a gentleman by the name of Theodore Haak, a German who had already lived in England for twenty years and who was fluent in the Dutch language. He had already translated several English books of practical divinity into German and was regarded by the Westminster theologians as a man, "whose affection and zeal to the Glory of God, and good of the Church we know to be such, that he would willingly bestow himself upon the accurate and painful prosecution of this Work . . ."
Theodore Haak accepted the task to translate the Dutch States Bible together with the annotations into the English language. The work was completed in 1657 and in this way the Dutch annotations were made available to the English-speaking world. This work, however, soon became forgotten until just two years ago the Gereformeerde Bijbel Stichting (Reformed Bible Society) in The Netherlands made a photocopied reprint of this original work. This completely photocopied reprint is bound in one volume and is available for the price of approximately US$200.00 (US). This edition has various drawbacks, however. The print is very old, rather unclear and therefore not easy to read. It is bound in one bulky volume, which does not allow for easy use. The notes are not easily accessible because they are simply inserted into the Bible text in a similar font and placed within brackets. In addition, this version contains quite a few errors and unexplainable omissions. Recently Inheritance Publications of Neerlandia, Alberta has taken the wonderful initiative to republish the original 1657 English translation of the Dutch States Bible with annotations in a modern typesetting. A team of editors is engaged in doing a very careful check and comparison of the original English version with the Dutch version. The many errors in the English version are being corrected because the committee is finding that in every chapter some textual references are omitted and some parts of a Bible verse is missing. This new English edition of the Dutch annotations is more faithful to the Dutch original and is very "reader friendly" because of its modern typesetting. The Bible text is printed in clear bold letters and the actual marginal notes in a smaller but still clear font. The Bible text is a translation of the Dutch States Bible from Dutch into English and therefore at times it varies from the English Authorized Version. 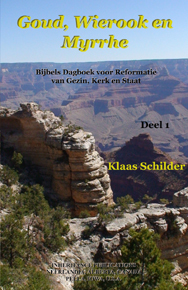 The editorial committee has made various corrections to the Bible translation supplied by Haak in order to be more faithful to the Dutch original. 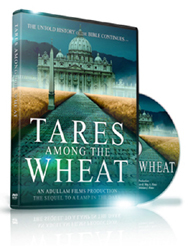 The whole project will comprise 14 volumes  10 volumes of the Old Testament and 4 volumes of the New Testament. Seeing the enormity of the work, the publishers plan to publish one volume per year. The first volume, Genesis and Exodus, has been published. At the present rate, the entire project is scheduled to be completed by the year 2016. It is our hope that the publishers will accelerate this work, for to have to wait another thirteen years until one can read the whole Bible with these valuable annotations is really too long. The books are handsomely bound and are of an excellent and durable quality. 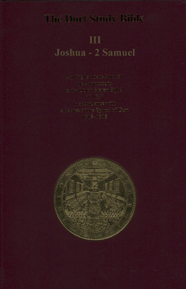 We can heartily recommend this Dort Study Bible to all our families and homes. Here we have at last a clear, succinct Reformed Bible with reliable annotations. This should be a welcome and long overdue publication for the English-speaking world that is being inundated by study Bibles filled with dispensational and other unreliable marginal notes. We can be very glad with this initiative and we sincerely hope that this ongoing project will be completed much earlier than anticipated, so that this work will be a blessing not only for future generations, but also for the present Bible-loving generation. 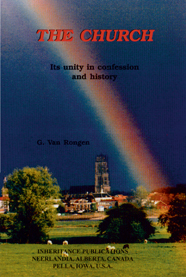 G. Van Rongen in Una Sancta: . . . We would like to conclude this review with a quotation from the last lines of this recommended! book. They are the following: The Gospel is covenantal in every respect. If things go wrong in the churches, ask whether the covenant is indeed preached and understood. If missionary work is superficial, ask whether the covenant is taken into account. . . If sects and movements multiply, undoubtedly they speak of the covenant in a strange way, or ignore it deliberately. . . It must be proclaimed. Evangelical = Covenantal. 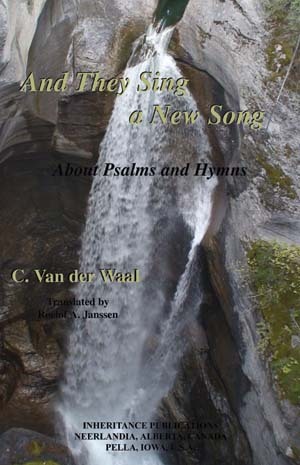 Reformed Churches have sung the Psalms for centuries. But what about the place of hymns in the worship services? 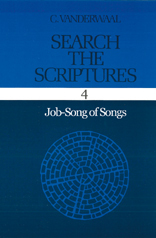 Van der Waal shows from Holy Scripture and history what criteria churches should use for the Song of the Church. A must read for everyone who loves the Church of Christ and desires to do His will also in singing to the glory of His Name. 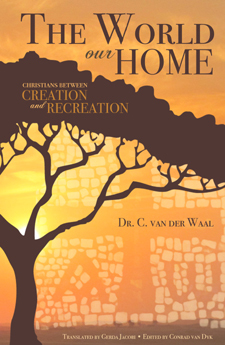 Dr. C. Van der Waal (1919-1980) is the author of numerous works in the areas of ecumenism, exegesis, and church history, among them The Covenantal Gospel (about the unity of Old and New Testament), Hal Lindsey and Biblical Prophecy, (about the Scriptural interpretation of Biblical Prophecy, especially of the Book of Revelation), and Search the Scriptures (a ten volume guide for Bible reading). Why do we accept the Bible and reject the Koran, the Edda, and the holy books of India? The author has no other answer than: "The Bible itself claims to be the sole revelation of God. And faith accepts this claim." In this series the author invites us to compare Scripture with Scripture, to look for themes that appear in book after book, to understand the framework of the divine plan of salvation. 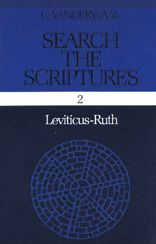 The author wrote this series to be used in high schools as a guideline to how we should search the Scriptures. Ideal for introductory Bible Study!
. . . our great and gracious God will reward the faithfulness of His children. Not because He has to, but because He wants to. He is like a father who promises his children to reward them for the work he gives them to do. Because He loves His children, He wants to encourage and inspire them . . . Who performs the good works believers do? Who is the source that allows them to produce fruits of thankfulness? Who else but God? Who else but the Spirit of Jesus Christ? . . . All thoughts of merit disappear in the light of the gospel of the crucified Christ . . . What an incredible display of divine mercy! The only answer to it is a life of love for the mercies of our God. Merit implies calculation. Earning credit points does not demand love. But true believers dont keep a record of their good works. They are overwhelmed by the gospel of grace. Their fruits of faith well up from hearts that stammer: "What shall I render to my Saviour now, for all the riches of His consolation?" 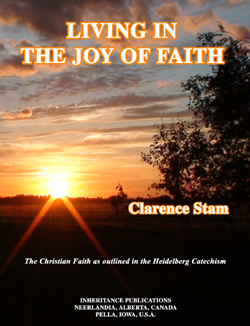 "The title for this book comes from the opening verses of Psalm 62, which are also the subject of a meditation. Only when we confess that God is our rock and our salvation do we have peace. 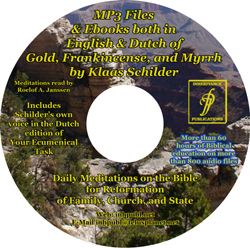 "The meditations are grouped into three topics which have been recurring themes in my ministry: forgiveness, Gods providence, and the Christian life." Rev. 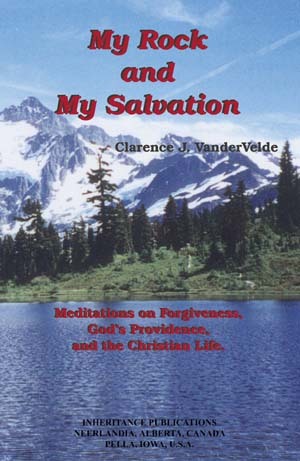 VanderVelde has found that these are matters with which many of Gods people struggle. In this book he desires to comfort and strengthen people in their walk of faith so that they may joyfully serve the Lord and His people. "Scripture is prophecy. This is true even of its historical passages. In other words, every story in Scripture reveals something of the counsel of God for our redemption. And in every story God is the prime agent. The entire work of redemption can be seen in each story." "This is a tremendous set of books." 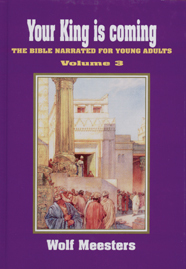 "These volumes set new standards in Biblical story telling." "I highly recommend this book. One of the best books available." 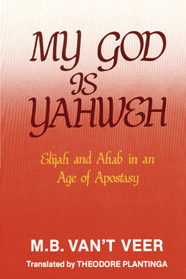 The time in which Ahab and Elijah lived and opposed each other was of special importance for the progress of God's Kingdom during the old dispensation. 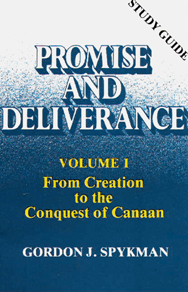 It was a vital stage in the history of divine revelation. Nehemiah . . . a prophet, a man of God, who turned to Him in prayer whenever troubles arose, and a church builder. In this book, Rev. 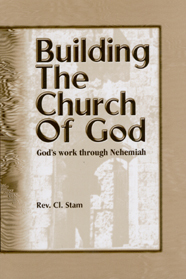 Clarence Stam shows how God faithfully continued His church-gathering work through Nehemiah, the church builder. It is comprised of thirteen sermons, with each one vividly illustrating Rev. Stam's unique insight into God's Word. Although the Name of God is not mentioned once in the book of Esther, there is ample evidence that God governs in such a way that his people are preserved for the great day of the Lord Jesus Christ. By His sovereign grace, God calls Esther to be queen of Persia for the benefit of His church. The book of Esther has a pivotal function in the Bible. It tells us how in the transition from the old to the new world, from eastern to western empires, the way of salvation in Christ is kept open. The scene is set for the birth of the Saviour of the world. The great King is coming. The Purim feast is today the church's celebration of advent. Christine Farenhorst in Christian Renewal: While reading these sermons both my husband and myself became convinced of the fact that Rev. 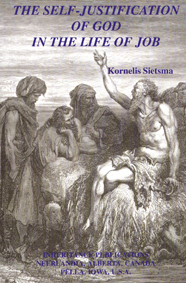 Sietsma was a compassionate and caring shepherd. His concern for and knowledge of the sheep in his care is obvious. The message of the all-powerful providential hand of God, so necessary for our own time, is conveyed. This moving exposition of 19 Psalms highlights God's covenant of grace with His people. Beisner shows the Psalms to be one grand mosaic crafted to inspire worship and a godly walk. "In these pages you will find the Spirit-inspired biblical anatomy of the Psalms and the hands of an outstanding physician and surgeon of the spirit. 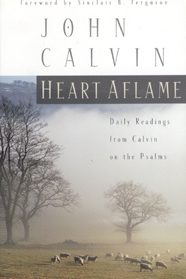 Reading them on a daily basis can hardly fail to bring you spiritual health and strength . . . . Calvin seems to come to us from within the Bible, from inside the reality described in the text. He has learned the meaning of the command to love God `with all your mind.' "
In this book Rev. 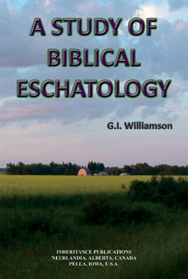 Stam discusses the meaning of the book of Ecclesiastes. This bible book is difficult to understand but it has a very plain message: because of sin all of life is meaningless without Christ. In His Son God gives direction to our lives and leads us by His Holy Spirit to rejoice in His work of salvation in anticipation of a new and better world. Daniel lived in frightening days; God's people were in the grip of a pagan empire, and that empire was under growing pressure from without. 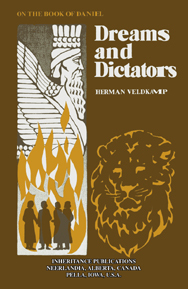 Against this background, Herman Veldkamp tells a dramatic story of dreams and dictators, of fearful visions and empires in collision, emphasizing that God's people are never forgotten, however desperate their plight. Veldkamp shows us how prophecy and history blend in the book of Daniel to present a single message. That message is intended to strengthen believers of all ages as they face the assaults of satan and his hosts and pray feverishly for the return and final triumph of Christ. 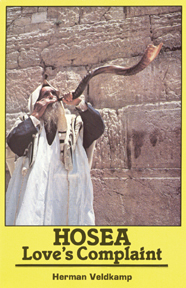 Jealousy, adultery, pain these are the themes that dominate the prophecy of Hosea. Against the background of his deteriorating marriage Hosea addresses an urgent message to all of God's people begging them to listen to the complaint raised by the Lord's wounded love. Herman Veldkamp skilfully illuminates the prophet's hard hitting accusations. 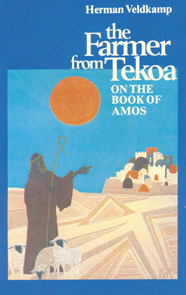 Written in a very attractive style, this commentary [on the book of Amos] can be enjoyed by young people and adults. Not only ministers, teachers, and students but indeed every serious-minded reader will find in this book tremendous helpful, brilliantly beautiful guidelines to understanding the prophetic messages of Amos. 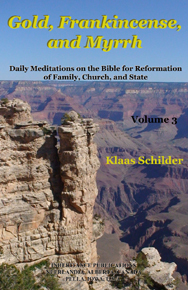 Meditations on the Christian Life. Old and New Testament characters are brought to life in this book of meditations. Their foibles, failures, and flights to glory are presented to inspire those today who walk the same paths. A considerable amount of scholarly energy has been spent in the past century in an attempt to determine who Jesus really was. Many researchers have concluded that the Gospels are not historical records, but largely propaganda or after-the-fact legendary embellishments reflecting the views of the early church. 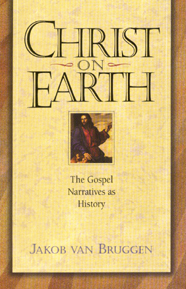 The author provides a solid argument for the historicity of the Gospels. "In an era when many want to pick and choose what in Scripture can contribute to describing Jesus, it is refreshing to read a book on him that takes seriously the testimony of the whole of Scripture. 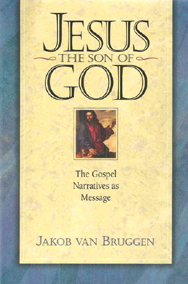 Jesus the Son of God interacts fully with and assesses critical scholarship, especially the more skeptical elements of the European study of Jesus. It competently treats the background to the life of Jesus as well as the key elements of his life and ministry. 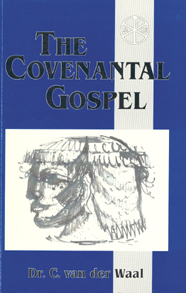 The work contains many insightful proposals about how to put the Gospel details and portraits together. Some suggestions will convince, others may not, but each is worthy of reflection. 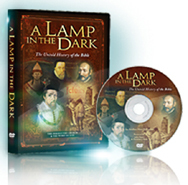 Most important, it sheds valuable light on its main concern, the person and work of Jesus." 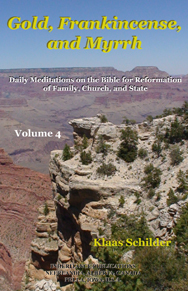 Mark D. Vander Hart in Mid-America Journal of Theology: People looking for a devotional and thought provoking introduction to the Sermon on the Mount will find this book by Dr. Jacob van Bruggen a delightful place to begin. 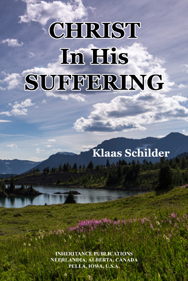 The author of this volume on the suffering of our Redeemer ought to become well known in English-speaking countries. 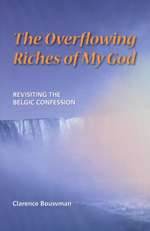 He is one of the most talented theologians of his day in the Netherlands. He is a deep thinker and an author whose writing are scintillating. They abound in paradoxes, which may not always be easily understood at first, but when thought through, like the well-beaten oil of the sanctuary they bring about keen intellectual satisfaction, discover new exegetical treasures in the Book of Books, and cause the reader to admire the exegetical keenness of Dr. K. Schilder.
. . . He has published several books, the chief of which are three volumes on the Suffering of our Lord. Each of these three books is complete in itself. The first one describes the suffering of the Lord Jesus in its initial stages, ending with the Garden of Gethsemane. The second covers the Lord's passion, till He was condemned to be crucified. The third one relates His suffering from the last named stage, ending with a chapter about His burial. His three volumes on the passion of Christ, still in print in this country, are landmark works. The only thing wrong with reading them, you know you will never read anything like them again. This detailed yet eminently readable description of Paul's life clearly shows that all sources converge to present a pioneer life. Waiting for Christ's return is not a passive matter of sitting back and doing nothing, as some of the early Christians thought. This Paul makes clear in his first letter to the Thessalonians. 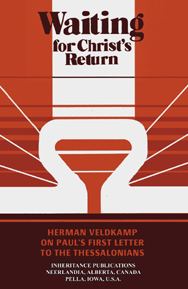 Herman Veldkamp focuses on the highlights of this letter in 21 short chapters, conveying to us something of the tense expectation that fills the lives of those who live for Christ and long for His final triumph. Paul opens his letter by giving thanks. 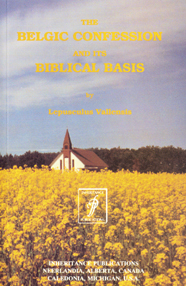 He then offers some practical advice and sets the Thessalonians straight on their misconceptions about the last things. Veldkamp gives us a vivid picture of the struggles of the Thessalonian Christians. The message hits home, for many of the their failures and misconceptions are ours as well. Is there a significant difference between our view of the Bible, today, and that of the great Reformers of the 16th century? The author of this small booklet believes there is. He does not think this is intentional. But he thinks it is a fact. 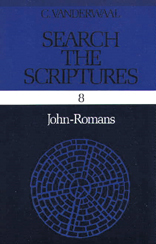 Our fathers said, "All things in Scripture are not alike plain in themselves, nor alike clear unto all: yet those things which are necessary to be known, believed, and observed for salvation, are so clearly propounded, and opened in some place of Scripture or other, that not only the learned, but the unlearned, in a due use of the ordinary means, may attain unto a sufficient understanding of them." The author also believes that two of those doctrines "which are necessary to be known, believed, and observed" are the doctrines of creation and consummation. It is necessary to know how we had our beginning. And it is also necessary to know what is planned by God for us in the future. And it is his contention that both of these (because they "are necessary to be known") have been clearly revealed in Scripture. And by this he means revealed in such a clear way that even the non-scholars can understand what God says about them. Is the Bible a Jigsaw Puzzle . . .
An Evaluation of Hal Lindsey's Writings. Is Lindsey's "jigsaw puzzle" approach the proper way to read Scripture? Was the Bible written to foretell the events of our decade? 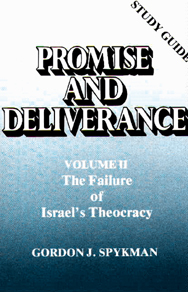 Hal Lindsey uses Biblical prophecy to open a supermarket, writes the author, a supermarket in which he sells inside information about the near future, especially World War III. The source of his information are the books of Daniel, Revelation, Ezekiel, and Matthew 24. Come, buy and read! Dr. Van der Waal not only analyzes Lindsey's weaknesses and mistakes, he also lays down basic guidelines for reading Biblical prophecy - especially the book of Revelation. 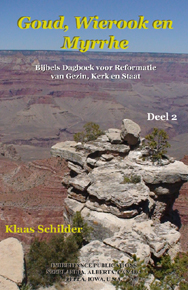 Jelle Tuininga in Christian Renewal: The sermons are easy to read and to understand. . . the book is recommended, and would make a welcome gift. John A. Hawthorne in Reformed Theological Journal: . . . The individual Christian would find it a constructive way to employ part of the Sabbath day by working through the lesson that is set for each Lord's Day. No one can study this volume without increasing his knowledge of truth and being made to worship and adore the God of all grace. This book will help every minister in the instruction of his people, both young and not so young, every parent in the task of catechizing and is commended to every Christian for personal study. Catechism preachingas we know it todaydates back to the time of the great Reformation. The Reformers wrote various catechisms which were to be used especially in the instruction of the youth of the Church, but this instruction soon developed into a full-fledged afternoon service. It should be noted, for example, that John Calvin in Geneva had the custom of teaching catechism classes at noon and that parents were required to bring their children and also to attend this instruction themselves! The Genevan Church Order stipulated that catechism instruction shall take place in the presence of the Church. In this way catechism instruction became catechism preaching. Similar practices developed in London and Heidelberg. In our time there is again growing opposition to catechism preaching, based mostly on the same old argument that a creed is not Gods Word and should not be used as text for preaching. The Reformed Churches, however, have responded to this charge by stressing that the catechism gives a faithful summary of Gods Word and that therefore a catechism sermon is also fully the preaching of the Gospel of Jesus Christ and a true exposition of the doctrine of the Scriptures. Catechism preaching has never impoverished the Church of Christ but instead has enriched the Church. This is so because this preaching provided a regular and systematic explanation of all the key points of doctrine contained in Scripture. The congregations were not subject to the insights and schemes of individual ministers but every year again heard a systematic proclamation of the full doctrine. History has shown that in times when catechism preaching was lacking, there was a general deformation and growing rejection of the Reformed confessions, while in times when catechism preaching was appreciated and diligently maintained there was growth in the knowledge and fruits of faith. Rev. Clarence Stam is pastor emeritus of Cornerstone Canadian Reformed Church at Hamilton, Ontario. He has served in various Reformed Churches in The Netherlands and Canada. He has previously written None Like Thee, a meditative excursion into the prophesies of Micah and Everything in Christ, the Christian Faith outlined according to the Belgic Confession. 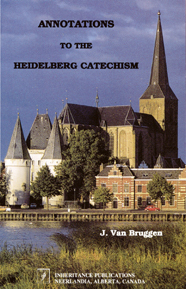 A Study of the Heidelberg Catechism in two workbooks for catechism students. 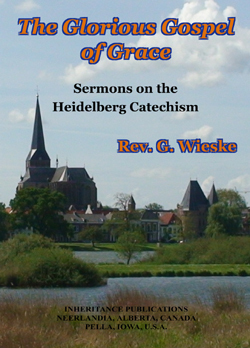 A Course of Study on the Heidelberg Catechism. 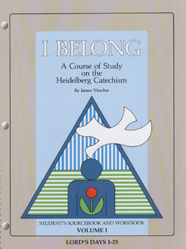 The aim of this course of study on the Heidelberg Catechism is fourfold: First, the students will be provided with a foundational knowledge of the Heidelberg Catechism on which they will be able to build all their life. 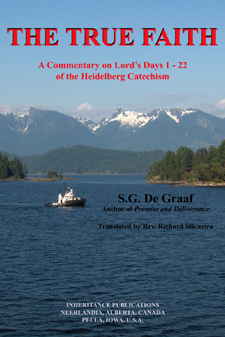 Second, the students will familiarize themselves with the background, structure, character, and contents of the Heidelberg Catechism. Third, the students will be urged to make the catechetical truth, which is biblical truth, their own. Fourth, the students must allow these truths to mould their perspectives, to shape their conduct, to strengthen their commitment, and to direct their endeavours in all areas of life. Spiral bound. We need to stand on the shoulders of those who have gone before us, to learn how they applied God's promises in the grit and grime of life's struggles . . .
W.L. Bredenhof in Clarion: This would be an excellent book for the use of study societies, for individual refreshment on the doctrines of the church, or as a textbook for preconfession or adult education. 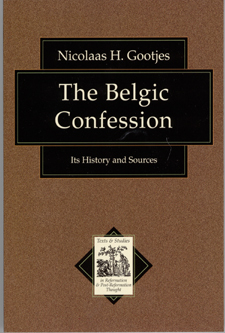 The Belgic Confession, written by Guido de Brès in 1561, has been adopted as a standard of Faith by many Reformed Churches throughout the world. A few outlines on Church History, liturgy, and church government have been added to give a more complete picture of life and views in the Canadian Reformed Churches of which Rev. Stam is a member. The gospel of the Lord Jesus Christ touches peoples lives where they laugh and cry, work and sleep, walk and drive. Four hundred years ago Guide deBres  a man of like nature to anyone alive today  put to paper what he heard God say in His holy Word. He did so in order that his congregation might receive encouragement and instruction in the midst of lifes dust and dirt. As the God deBres confessed in the Belgic Confession does not change, Christians living in todays tumultuous times can still receive encouragement and instruction from this creed of centuries ago. 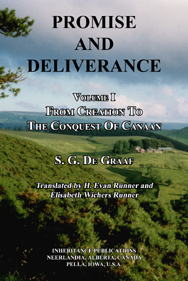 This book attempts to give the reader a feel for how believers of long ago worked in trying circumstances with the promises God had earlier given in Holy Scripture. The link is then made to our times, and how todays believers can benefit from the way yesterdays believers worked with Gods revelation. This book is for those who wish to know better who the God is that leads and governs every event in todays world. Questions to assist discussion conclude each chapter. The stimulus for the existence of the Canons of Dort goes back to the controversy between two professors, Gomarus and Arminius at the University of Leiden. In this dispute the age-old issue of whether the human will was free or not was central. Can a person on his own choose for God or not? What causes people to respond so differently to the gospel? Already in early church history (5th century) Augustine and Pelagius confronted each other about this question, and during the Reformation (16th century) Erasmus discovered in Luther a strong opponent to the doctrine of the free will. The question of whether the will is free or not is related as well to the doctrine of double predestination, meaning that God elected and reprobated from eternity. Rev. 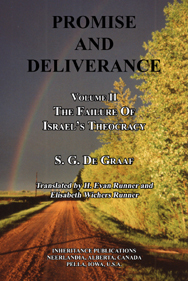 Feenstra explains the doctrines of Total Depravity, Unconditional Election, Limited Atonement, Invincible Grace, and Perseverance of the Saints. Rev. 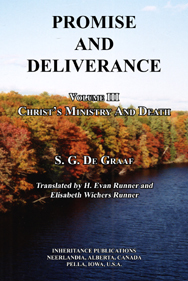 Van Delden explains the doctrines of Total Depravity, Unconditional Election, Limited Atonement, Invincible Grace, and Perseverance of the Saints. This book is designed to serve the Christian Community as a study guide for personal enrichment and group discussions. Each of the thirty-two chapters is introduced by a pertinent Scripture passage, followed by brief explanations, leading up to questions which act as pump-primers for a free exchange of ideas. "The planet on which we live is becoming smaller and smaller. It seems as if it is no longer true that the East is far from the West. Distances are shrinking. At the same time, our world of interest is becoming larger and larger. What is happening on the other side of the globe can be watched as it happens. "In the field of church life, too, this process of shrinkage and expansion is going on. These modern times have brought us into contact with other churches which we had hardly ever heard of a few decades ago. After the war, our immigrant churches went through a period in which we settled into a new country and had to build up our church life from scratch. Now, however, we are able to have closer contact with our ecclesiastical environment and have discovered some of these churches. "This has raised the question: How are these other churches to be regarded? Must we, with a good conscience, leave them alone? Or, knowing that Christ wants His Church to be one, ought we to initiate dialogue with them? This is why our immigrant churches in various countries have been involved, sometimes for many years, in discussions with other churches." "The best we can do in such a situation is to read and study our confessional standards and try to learn some lessons from history. That is the aim of this book. For that reason, we shall pay particular attention, first of all, to what the Belgic Confession says about this important subject, focusing on Articles 27, 28, and 29, since they contain the Scriptural fundamentals. Then we shall listen to what Church history teaches us about unity of faith as something basic to Church unity. 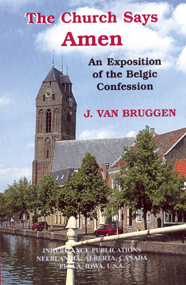 Finally, we shall see how Church unity was endangered but, by God's grace, also preserved in the events connected with the Liberation in the Dutch churches during the 1940s." This is what eighty-year-old Rev. G. Van Rongen writes in the Prologue of his book, which deals with what we believe concerning the Church of our Lord Jesus Christ. Rev. Van Rongen has spent the major part of his life pastoring and shepherding God's people in Reformed Churches in The Netherlands, the U.S.A., and Australia. 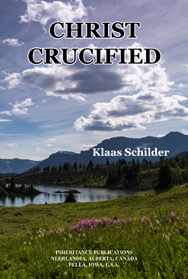 Throughout this book and many of his other writings, it is clear that it is a great joy for him to serve his God and Saviour, as well as God's covenant community, the Church, by following in the footsteps of one of his earthly mentors, Dr. Klaas Schilder. Like Dr. Schilder, he has laboured in obedience to the prayer of the Lord Jesus Christ in John 17: "That they all may be one!" It is no surprise to find the following paragraphs at the end of this book: "In our church life, we try to avoid synodocracy, ministeriocracy, and even consistoriocracy. All of our church members are involved in the issues that require our attention, and that is why I express the hope that all who have reached the years of responsibility would join me in contemplating what we actually believe regarding the Church. "Let us not forget that it is the Church of our beloved Saviour!" True faith is a sure knowledge whereby I accept as true all that God has revealed to us in His Word.At the same time it is a firm confidence that not only to others, but also to me, God has granted forgiveness of sins, everlasting righteousness, and salvation, out of mere grace, only for the sake of Christs merits.This faith the Holy Spirit works in my heart by the gospel. 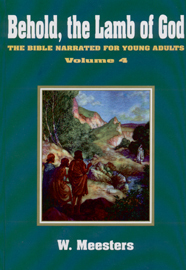 The many children's Bibles available today are aimed at young children. 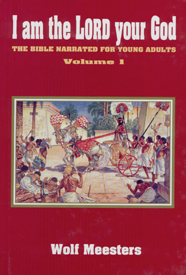 In contrast to those children's Bibles, this book relates the stories of the Bible at a level intended to appeal to adolescents. 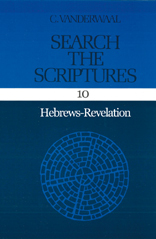 It provides a wealth of Scriptural information in a very readable, story-like form. The style makes for light reading, yet the book is both instructive and spiritually rewarding. 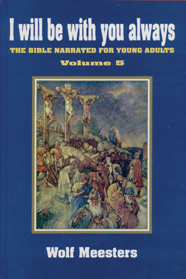 Author Wolf Meesters enriches the young reader's insight by showing the Christ-centered line that runs like a golden thread through the Bible. 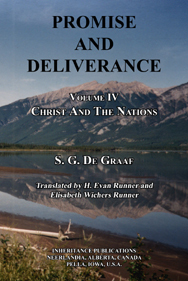 This volume deals with God's redemptive work from creation to the death of Joseph in the land of Egypt. The end of the reign of King David through the time of the kings and prophets, the events leading to the exile of Israel and Judah, God's care of the exiles, and their return to rebuild Jerusalem. New Testament: The birth of Christ and the start of His ministry. 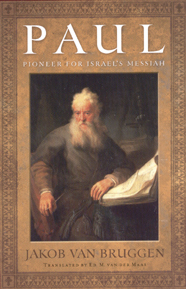 The most reliable, most trustworthy, and most Christ-centered story Bible available. In his preface to the first edition (1948), the author writes that he has in mind those who are at an age between childhood and maturity  that is, adolescents. The end of Jesus Christ's earthly ministry and the continuation of His work through His apostles to establish the New Testament Church. Incomparably the best-seller of all time, the Bible is the Book of Books to millions of men and women of different faiths and denominations. But how many of them have more than the most rudimentary knowledge of the Bible's history - of how it was written, how it spread across the world, and the amazing influence of its narrative? 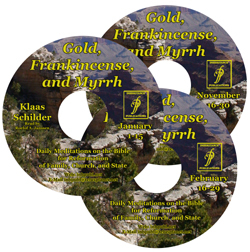 It is an exciting story, stretching across sixty centuries and many lands: Egypt of the Pharaohs, Canaan, the "land flowing with milk and honey", Luther's Germany, a deserted limestone cave by the Dead Sea . . .
Mr. Wegener tells the story with verve and skill and a feeling for history, marshalling an impressive list of characters. 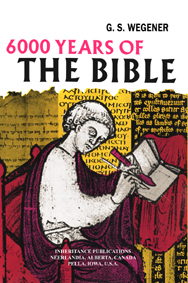 Mr. Wegener's text is accompanied by more than two hundred beautifully printed illustrations of the earliest Bibles, illuminated manuscripts, biblical sites and precious bindings which go to make up one of the most beautiful books about the most important book in the history of mankind. In the De Reformatie of June 25, 1960, Rudolf van Reest wrote an extensive review of the Dutch translation of a German book, called 6000 Jaar en een Boek (6000 Years and a Book), which he "gladly recommended" to his readers. When, 5o years later, I read his review I searched for the book and was very pleased to find a used English edition. Yet, when I received it, I was not so certain that it was accurate enough to republish. In the last 50 years many readers of the Bible have become confused about the reliability of the translation (or paraphrase) of the Bible they use. They were weaned away from the reliability of the Authorized (King James) Version of the Bible, not because that translation was claimed inaccurate but because "we need a Bible in todays language." Yet they were surprised to find all kinds of missing passages, totally different meanings, and confusing ideas in several newer translations. And this has become a great concern for many people who love the Bible. The worst thing about all of this was that most people trusted the "scholars," often unaware that there are perhaps as many scholars that disagreed as that agreed with these changes, though the majority of the latter would never get tired of affirming that they had no problem with the "King James Version." Enter into a world of saints and martyrs battling against spies, assassins and wolves in sheeps clothing. Through the Middle Ages, the Inquisition forbade the translation of the Bible threatening imprisonment and death to any who disobeyed. Learn the stories of valiant men who battled the principalities of the Dark Age to communicate the Holy Scriptures to a lost and dying world. The sequel to "A Lamp in the Dark." 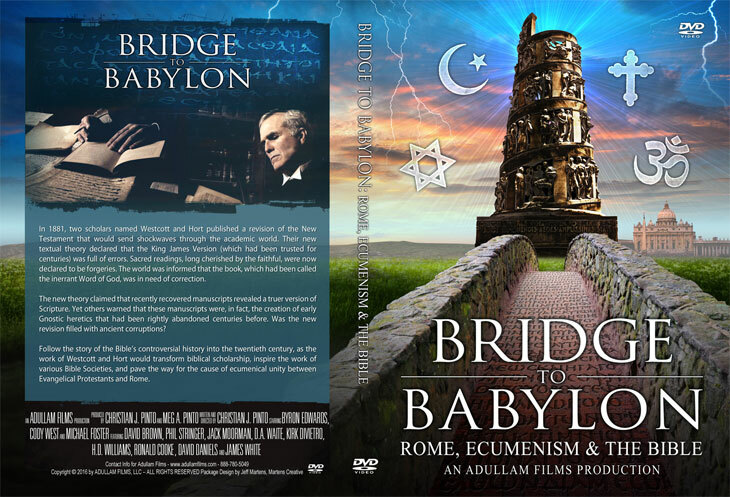 This powerful documentary explores the controversial events that occurred just prior to the deveopment of the new Bible movement in modern times. In the 19th century, a revolution in biblical scholarship was prompted by the publication of a never-before-seen manuscript called Codex Sinaiticus. The work was discovered by a German scholar named Constantine von Tischendorf, who declared this to be the oldest Bible ever found. Tischendorf claimed he found the work discarded in a rubbish basket at St. Catherines monastery in Egypt, and the monks, he said, were using the pages to fuel the fire. While many in the academic world did not fully believe his story of the discovery, they were willing to accept his claims about the antiquity of the Codex.